L-R: Matthew Hague, Owner and executive director of Microlise, with Guenter Butschek, CEO & MD, Tata Motors. 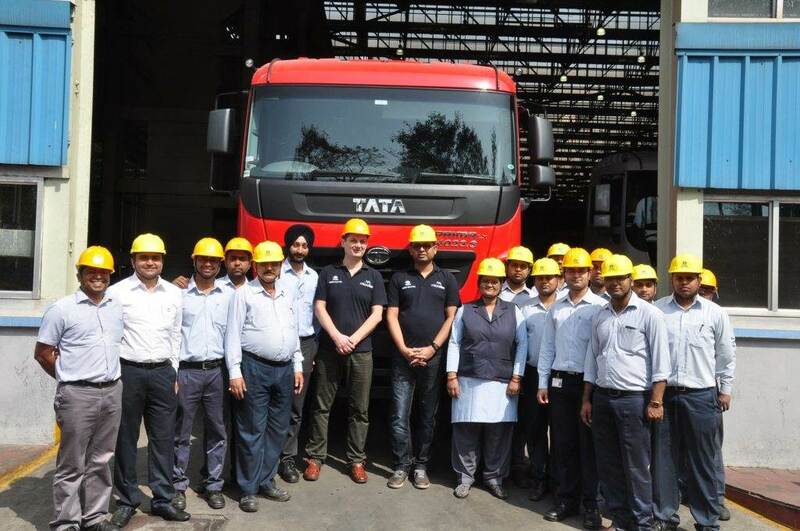 Tata Motors has become the first vehicle manufacturer in India to install 100,000 advanced telematic systems on its commercial vehicles. The company says it was the first OEM in India to adopt this technology and integrate it into its offerings in India, under the Tata Fleetman brand name. Fleetman is the result of the company's partnership with the UK-based Microlise, one of Europe’s leading telematics and fleet management companies. On September 8, 2014, in a multi-million pound deal, the two firms entered into a five-year contract that will see Microlise supply Tata Motors with its specialist fleet telematics. Microlise's in-vehicle hardware and a web-based portal allows Tata Motors customers to manage their transport fleets efficiently and safely. 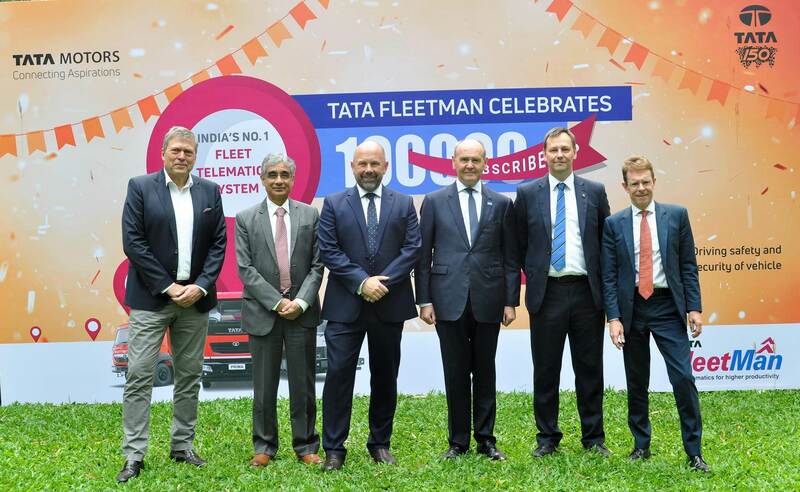 Tata Motors launched Tata Fleetman Telematics in response to growing market needs for better fleet control and greater fleet utilisation. Tata Fleetman generates rich fleet insights and goes on to collaborate with the customer to offer specific interventions towards improvement in the utilisation, performance and safety of the fleet. For Microlise, its partnership with Tata Motors represented its first move into the Indian market. In March 2015, at the Tata Motors Jamshedpur plant, the first production vehicle – a Prima LX 4023.S tractor – fitted with Microlise hardware, rolled off the line. The Tata Motors and Microlise teams with a PRIMA LX 4023.S tractor – fitted with Microlise hardware – at the Jamshepur plant in March 2015. Emergency SOS: A panic button in vehicles through which the driver can send an SOS message to the transport owner in an emergency. Trip Management: A versatile tool to track and evaluate individual vehicle trips in real time. Trip Management helps achieve significant improvements in fleet utilisation and reduction in communication costs and idle times. Driving Assessment: Since drivers are the most important resource factor of transport operations, the driving assessment solution continuously evaluates drivers on a range of parameters impacting safety and economy. Suitable consultancy and retraining is then employed to improve overall fleet economy and safety record. Vehicle health management: A solution which helps remotely monitor vehicle health, including quick fault detection and rectification before it can lead to consequential failures. L-R: Guenter Butschek, CEO and MD, Tata Motors; O P Bhatt, independent director, Board of Directors of Tata Motors; Matthew Hague, owner and executive director of Microlise; Sir John Peace, chairman of The Midlands Engine; William Hopkinson, First Secretary (Investment) and Andy Street, Mayor of West Midlands. Tata Fleetman is closely integrated with Tata Motors’ Suraksha which is the maintenance contract offering or AMC. Tata Motors says it is the sole OEM in the country to establish a proactive maintenance interventions process based on the real-time fault code transmission – this service is available on the Prima range covered under AMC). With over 1,200 workshops, Tata Fleetman is gearing up for the next level of fleet telematics with advanced trip / journey management features that cater to the complex requirements of sectors like e-commerce.